According to a CNBC article, there are a handful of rich athletes who live like they're broke. Read about these pro athletes who keep the millions of dollars they earn by being smart about their finances. It really is a testament to their frugal and savvy lifestyle. Sigh... they're just like us :) Read on, and maybe you can even learn some money tips along the way! Despite earning massive paychecks, a surprising number of former professional athletes end up broke. NFL players, for example, make an average of $1.9 million a year. Yet a full fifteen percent of them end up declaring bankruptcy. A handful of pros are working to make sure they won't fall into that category. Here are some athletes who earn millions, but you'd never know it based on their lifestyle. ​When MLB pitcher Daniel Norris was drafted at age 18 in 2011, he scored a $2 million signing bonus that made him a millionaire overnight. But the Detroit Tiger doesn't live like a millionaire. Norris drives a $10,000 Volkswagen camper, which he converted into a tiny home and lives in during the off-season. ​He also lives off of less than $1,000 a month, ESPN's Eli Saslow reported in 2015: "His advisers deposit $800 a month into his checking account — or about half as much as he would earn working full time for minimum wage." "Just because money is there doesn't mean you have to have nicer things than you used to have," Norris told ESPN. "I'm actually more comfortable being kind of poor." Washington Redskins quarterback Kirk Cousins earned $19.9 million last year and will take home $23.9 million this year. Yet the 29-year-old NFL star still chooses to live in his parents' basement with his wife during the summer. He also drives a dented GMC Savana passenger van that he bought from his grandma for $5,000. Cousins isn't the only Redskin living on the cheap. Pass rusher Ryan Kerrigan, who signed a five-year, $57.5 million contract in 2015, shares an apartment with childhood friend Andrew Walker and drives a modest Chevy Tahoe. Kerrigan also keeps his food costs low, Walker tells the Journal: "He makes most of his own meals but when he does splurge, he's going to Chipotle." How awesome is it that he's not only frugal (like me), but he also loves bulldogs (like me), check out his English Bulldogs Franklin and George below. ​Wide receiver Ryan Broyles, who was drafted by the Detroit Lions in 2012 and is currently a free agent, has lived on a modest $60,000 a year throughout his NFL career. That's a fraction of his salary, which has been as high as $570,000. He prefers to stash the rest of his earnings in investments and retirement savings accounts. "I still splurge every now and then," Broyles writes on The Players' Tribune, but, in general, he keeps things cheap: "I don't have cable. I use Apple TV and Netflix. My wife and I don't go out to eat a lot, and I make sure I pay off my credit cards every month." The Detroit Lions safety, who earns an average of $6.5 million a year, has been saving 70 percent of his take-home pay since he was drafted in 2009. Quin is also a savvy investor. He puts 10 to 20 percent of his savings in private equity companies, which could eventually double his income. The plan has always been to "save as much money as I can and spend as little as I can in the time that I have in the league," Quin tells CNBC, "so that I can maximize my future." Everyone knows LeBron plays stingy defense, but it turns out that ~stinginess~ also leaks into his life off the basketball court, according to this BuzzFeed post. During an interview with his freind and teammate Dwayne Wade, ESPN's Rachel Nichols asked LeBron if it's tru that he's the cheapest guy in the NBA," as Wade says he is. 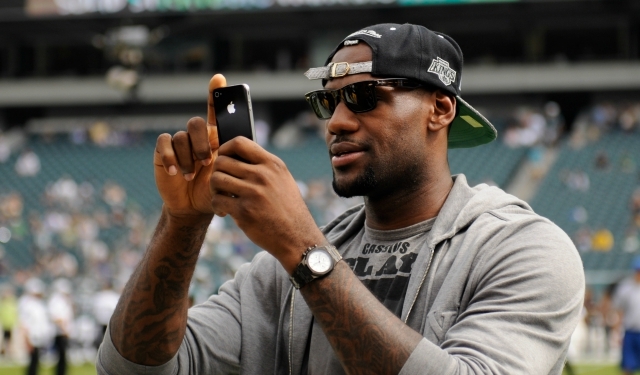 LeBron admitted there's some truth behind that sentiment, listing a few examples of his frugalness, with comments such as ... "I still got Pandora with commercials" and "I'm not buying no apps" and below. Who knew LeBron and I have so much in common! For more tips on savvy investments and living large on a frugal budget, click HERE.